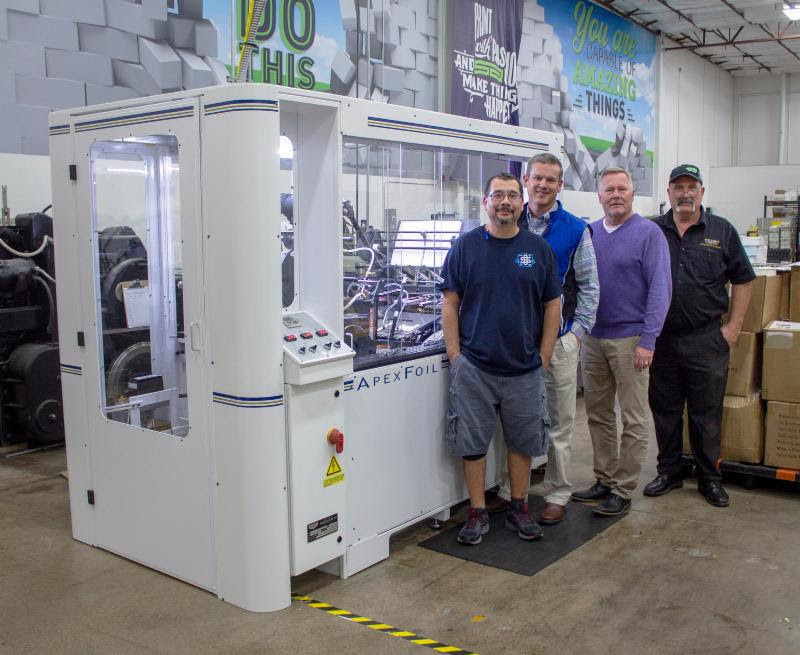 St. Croix Falls, WI November 8, 2018 - Slate Group, a national commercial printer out of Lubbock, TX, has greatly expanded their in-house capabilities to include Foil Stamping and Embossing by installing Kluge's ApexFoil machine. Although the key properties of foil stamping are easy to identify - Time, Temperature, and Tonnage (3-T's) - they have often been difficult to measure and control. Operators at Slate Group can use the ApexFoil's Compass™ control system that includes patented features to control the 3-T's. Compass allows operators to greatly reduce, and in some cases, eliminate make-ready on every job. Slate Group focuses on providing their clients with a consistent look, no matter the print job requirements. Since opening their doors in 1985, they have aimed to build a reputation of creativity, consistency, and quality. They involve their customers as much as possible in the creative process, coming up with print solutions customers originally didn't know were possible. And by adding foil stamping and embossing they can control the turnaround times and ensure the quality standards their customers at Slate Group have come to expect. Adding value since 1919, Brandtjen & Kluge is an industry leader in manufacturing specialty print finishing and converting equipment. For 99 years the brand name "Kluge" has represented innovation, technical leadership, productivity and rugged durability to companies worldwide. Recently acquired by Mark Andy, a pioneer to the label and packaging industry, Kluge remains headquartered in St. Croix Falls, WI, and will continue to market equipment through a direct sales force in the United States and Canada as well as with a well-established network of industry-qualified distributors to provide global coverage. For more information visit us at www.kluge.biz.